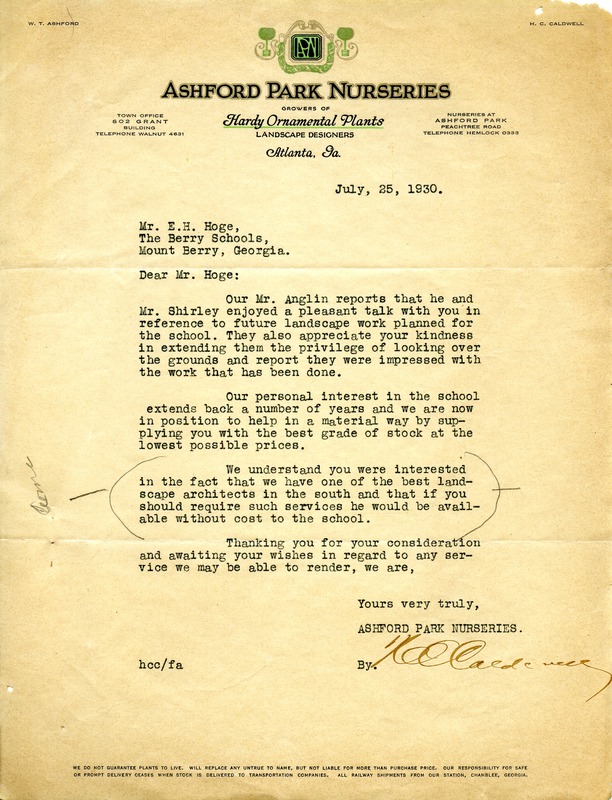 The letter references a meeting of Mr. Anglin from the nurseries and Mr. Shirley, specifically the understanding that Berry is interested that the services of Ashford Park's landscape architect, one of the best in the south, would be available at no cost to the school. Ashford Park Nurseries, “Letter to E.H. Hoge from Ashford Park Nurseries.” Martha Berry Digital Archive. Eds. Schlitz, Stephanie A., Sherre Harrington, Chelsea Risley, et al. Mount Berry: Berry College, 2013. accessed April 20, 2019, https://mbda.berry.edu/items/show/11957.